Airports in Spain, Portugal and Morocco have reopened after days of disruption caused by a cloud of ash emitted from an erupting volcano in Iceland. In Spain, Valencia airport - the last in the country to lift restrictions - reopened at 0600 GMT. The ash cloud has led to closures at Spanish airports since Saturday. The European air safety agency has meanwhile proposed new rules which would limit airspace closures due to volcanic ash, AP reported. Portugal's NAV air traffic authority said the ban on flights was lifted on Wednesday and released a statement saying there was "no more disruption". In Morocco, restrictions were due to be in place until 0600 GMT on Wednesday. The ash from Iceland's Eyjafjallajoekull volcano led to a huge aerial shutdown last month, but only affected North Africa for the first time last weekend. Icelandic volcanologists said the ash, left over from previous weeks, could be carried around in the atmosphere by winds. 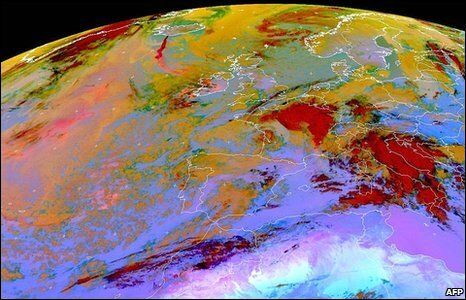 Eurocontrol, the European air traffic control, said ash concentrations at lower altitudes were still posing problems for trans-Atlantic flights. The European air safety agency has submitted a proposal with rules which would impose a 120-mile no-fly buffer zone for all aircraft near a visible ash cloud, according to AP. "I can confirm that the agency has been discussing a new solution to the renewed threat of airspace closures due to the volcanic ash cloud," agency spokesman Daniel Hoeltgen told AP. The new regulations, if adopted, would be similar to guidelines in the US and could give airlines more flexibility on flight decisions. In the UK and Ireland, rules governing air safety during the volcano crisis were eased by the Civil Aviation Authority, the UK safety regulator. It said it had lifted the 60-mile no-fly buffer zone imposed around dense areas of ash cloud, clearing the way for more flights. It is almost a month since the volcano in Iceland first erupted, causing the largest aerial shutdown in Europe since the Second World War. The budget airline Easyjet alone had to cancel more than 6,500 flights. It has announced that the disruption cost it up to £75m ($110m) and is now seeking compensation from governments.